If you have a more specific question or want more information about Sharknado™: The Board Game! and our other forthcoming titles, you can find us on Facebook, Twitter and Instagram (@DeviousDevices). Yes, this is the officially-licensed Sharknado™ board game. We’ve been developing the game for about nineteen months. 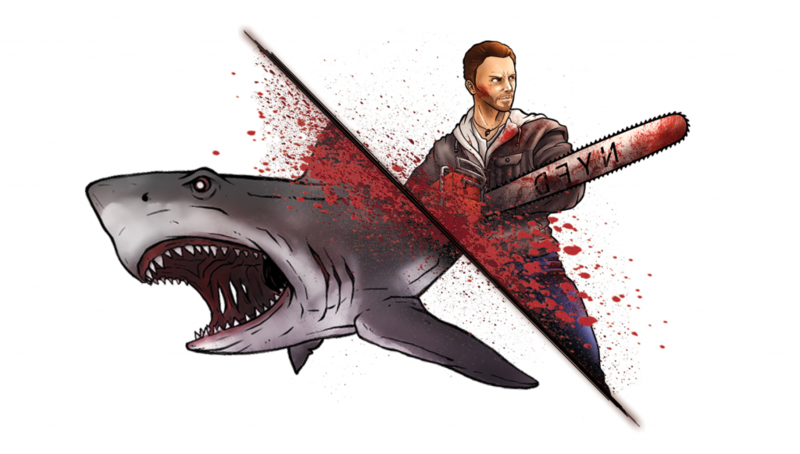 Yes, we really do enjoy the Sharknado™ movies. Don’t you? No, we haven’t met David Hasselhoff personally. Yet. Arguably one of the most important aspects of the game, the system that has changed the most over the development cycle, is combat. It’s how you find, fight and kill sharks — or, the way in which you get killed by sharks. Characters can die without the game being player elimination. Every fight should be unique (no “red shirt” sharks). Every shark, and every character, should be deadly. Those last two are particularly important; in a nutshell, that means that every shark in the game can be dangerous, and that characters aren’t pigeonholed into a specific role (we’ll explore characters more in a future article). That also means that while combat isn’t entirely luck-based, there’s some degree of chance involved. Sharknado™: The Board Game! is chaotic by design, just like the films. 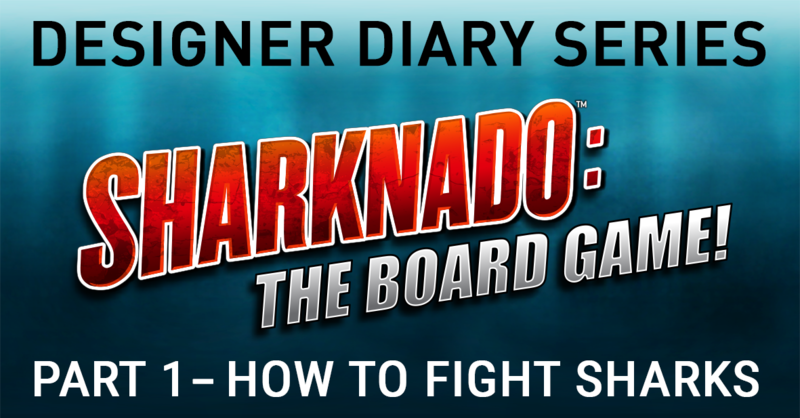 If you played Sharknado™ at Gen Con 2016 or earlier, you’ll know that our combat system at the time used eight-sided dice (we actually tried a totally different d6-system to start development, but this was far too random). This was largely to provide a greater range of values to better refine and balance the numbers our shark used to bite you and for you to hit them.. Sharks had three stats: a Threat value (what you roll to hurt it), a Bite value (how many times they attack), and a Fin value (how much “health” each shark has). Characters had three types of dice: Ranged, Melee, and Defense. Ranged dice hit immediately; then sharks would bite; and finally the Melee dice would hit. Fins were, essentially, a shark’s hit points. Bites were the number of times it would strike, and the Threat was the number to meet or beat on your dice. While this system was tested and refined for months, honed to be balanced and tight, there were still a few problems. First, there was the practical dilemma: eight-sided dice are expensive, and to accommodate the dice pool sizes (3 types, times 8 dice each), the game would have to include 24 of them. While not an issue on its own, this meant that each player would need to wait for the one currently fighting to finish their fight and pass the dice. This slowed the game down tremendously as other systems developed in their own ways and games got longer. Solving this would have required 4 times that number of dice — 96 of them! — which was strictly out of the question for your wallet. Then there was the mechanical issue: fights didn’t feel as dangerous as they should. We wanted characters to get bit and occasionally die (as we’re fond of saying to playtesters, the character you start the game with might not be the hero of this story!). While defending against bites felt good to the average player, characters living through entire games went against one of the pillars we’d set up for the game’s experience (lots of casualties). Lastly was the thematic problem, which was that fights took too long, averaging three or more minutes each. It is important for game length and theme to keep fights quick and to the point– it’s either you or them. You should only have to roll dice once or twice in most fights to crown a winner. Outside of the relevance to Sharknado™, there was nothing inherently wrong with the d8 combat system. Several people have drawn favorable parallels between the Sharknado™ game and dungeon-crawlers or cooperative roguelikes; the problem is that Sharknado™ isn’t a dungeon-crawler, at least not thematically, and fights needed to feel snappy. Maybe someday we’ll circle back around to utilizing that original system, but for this game, we felt that players should know in thirty seconds or less if they’ve killed a shark, or if they just got an arm bit off. Defense is now gone. The distinction between Ranged and Melee damage is gone. The Bites on the sharks are gone. And, after a lot of math and rebalancing, the eight-sided dice were changed to six-sided dice. In the new system, each player in a fight throws a fistful of dice based on their equipment and, at a glance, can see the values that hit the sharks they’re fighting or don’t. It’s much simpler and quicker, but not necessarily diluted; each shark has a unique special ability that can screw with combat (and layer to create deadly combinations), and each weapon has an ability that can be used to facilitate shark murder. We maintained the Threat value and Fin value on the sharks, but those are the only two stats now. For characters, the only thing you need to know going into a fight is how many dice you’re throwing, what your abilities are, and how injured you are — because sometimes even the easiest shark can take you down, just as we’d hoped from the beginning. There’s a phrase that we often repeat to each other when we’re designing a game and we’re forced to reconsider something that seemed set in stone, It’s Faulkner’s advice to new writers, that you must “kill your darlings.” In our case, we had a solid, balanced combat system, but it just wasn’t right for this game — for your game. We had to kill a darling, gut it, and rebuild from the scraps. If you’re a game designer, this is priceless advice. It doesn’t matter how great or innovative a system might be — you have to take the mechanisms, theme, and player experience into account when considering your systems, and ask yourself, “Is this right for this game? Does the culmination of these aspects add up to the experience that I want my players to have?” If not, it’s time to kill your darlings and reconsider your design approach. Stay tuned for part 2 of our Designer Diary series about the evolution of components and the staggering number of tiny cardboard pieces that our dogs manage to find in the carpet. If you’d like to stay up to date on all things Devious Devices, you can go to our website and sign up for our newsletter at the bottom of the page. If that’s too much work, you can follow us your favorite social media platform. That only requires, like, a couple of clicks.